Hi friends: I just want to tell you that this post is paid partnership with Lowe’s Home Improvement, but you know how I roll on these things: You’ll always get my honest opinion. I’ll be the first to admit that I will never have a lawn that looks like a golf course. And I’m 100% OK with that. My goal for a lawn is for it to be green and organic. That means that I’m OK with a few weeds, so long as they aren’t pokey (thistles must go) and green. What’s more important to me is not adding unnecessary synthetic treatments to the lawn and making sure that it’s safe for us, our dogs and any wildlife that may come for a visit (except for deer … they are not invited to our lawn party!). Given that approach, we don’t do much to our lawn other than cut it (and I will dig out any weeds that are particularly offensive to me). It is really an extremely low-maintenance lawn. And most of what we do happens in fall in just a few hours. It starts with a regular mowing, if for no reason other than that I find freshly cut grass much nicer to work on and walk on. 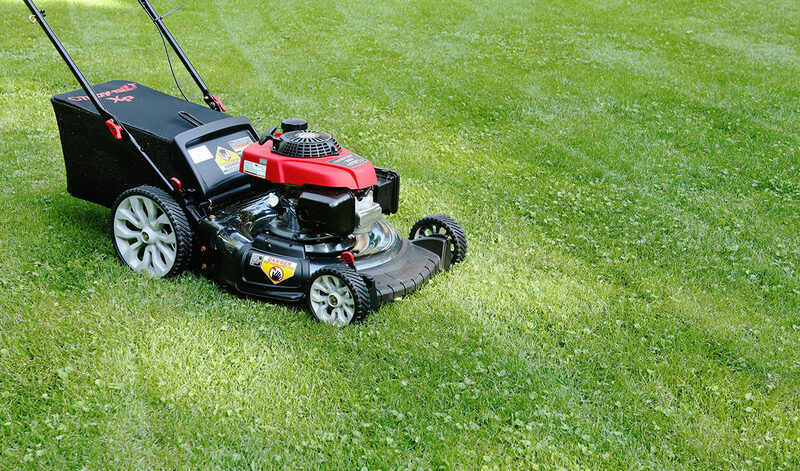 I’ve reviewed a lot of Troy-Bilt lawn mowers over the last few years and it has allowed me really get a feel for the differences between mowers. Turns out, a mower isn’t just a mower. 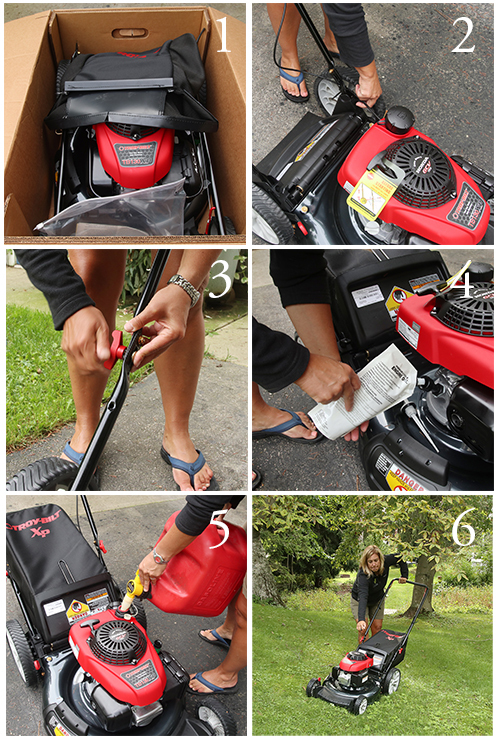 I tried out the Troy-Bilt TB130 XP 21-inch push mower this fall. 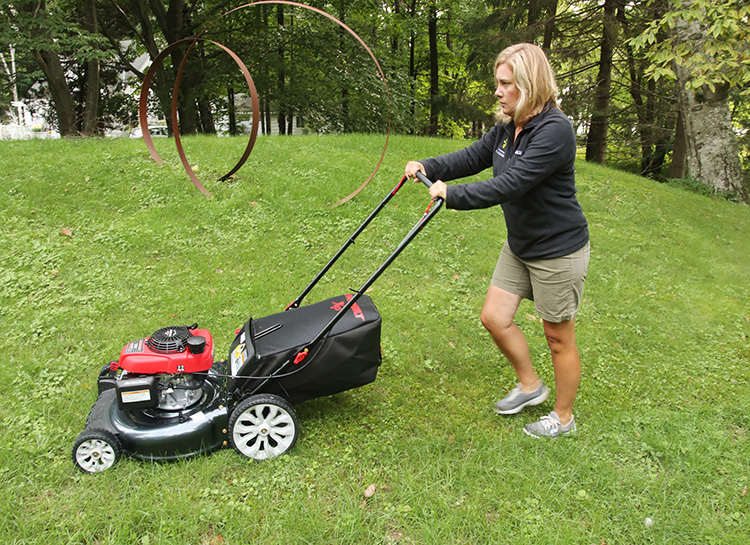 This one is a little smaller and less expensive than two other walk-behind mowers I’ve tested from Troy-Bilt, the TB490 XP self-propelled mower and the TB320 self-propelled walk behind mower. First off, I just want to say that if you are at all intimidated by buying a lawn mower, don’t be: This mower was so easy to set up. Take it out of the box, (I should probably tell you to read the directions here too), loosen the two black screws on top, pull the handle out about 8 inches, then flip the folded part of the handle over, screw in the bolts tightly (this is all done by hand, no tools necessary). After that all you have to do is fill up the oil (included so you don’t have to hunt for some) and fill up the gas tank. Setup on the TB130 was really simple: 1. Take it out of the box, 2. Unscrew the black pins at the bottom of the handle then pull the handle out and replace the pins, 3. Unfold the handle and put in the red pins, 4. Add the provided oil, 5. Add gas, 6. Just pull. I thought it would be a lot harder to pull, hence the steely look of concentration on my face! 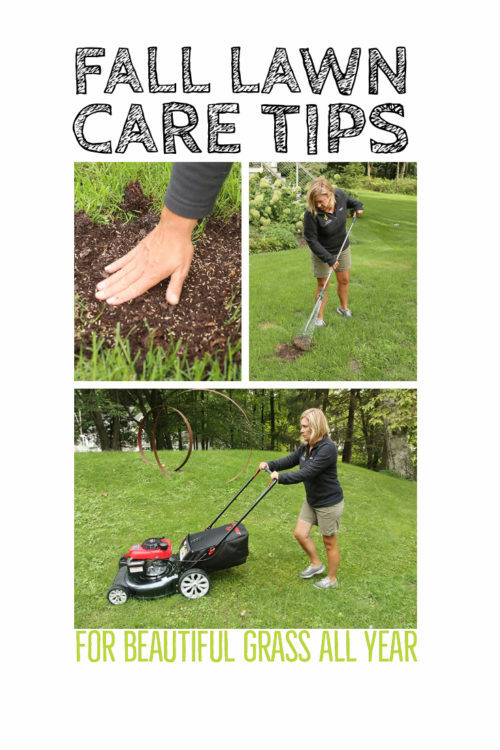 From there, it’s just a matter of pushing that baby along, making sure that you have the wheels set high enough that you’re not cutting the grass too short, a cardinal sin of lawn mowing. The TB130 is not self-propelled so you really are pushing it (as compared to self-propelled mowers that sort of pull you along), but it’s light enough that it never felt like a chore. If you had a hilly property, you probably would want to go with a self-propelled mower, but for smaller or flat yards, this one could be just the ticket. And for significantly less money, this mower is probably just right for a lot of homeowners. 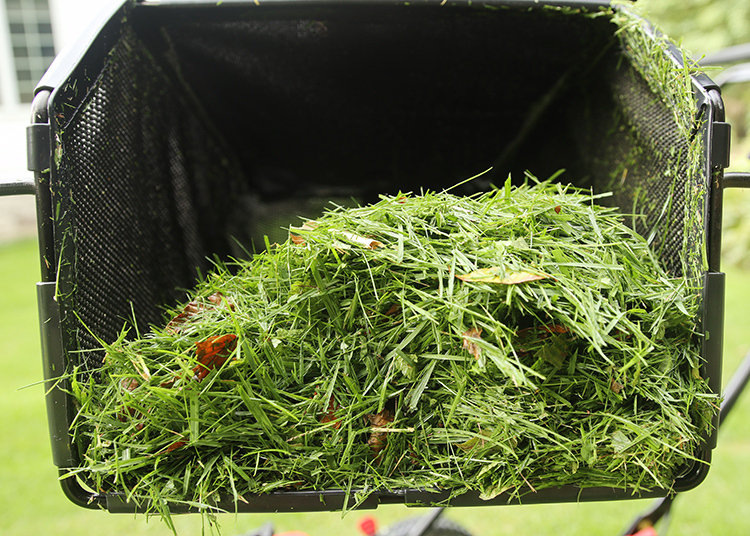 You can collect clippings in the provided bag or take it off for the grass to mulch and leave on the lawn to break down and improve the soil. After giving the lawn a nice trim, the next step is fertilizing. My theory is to keep the grass happy so that it outcompetes the weeds. 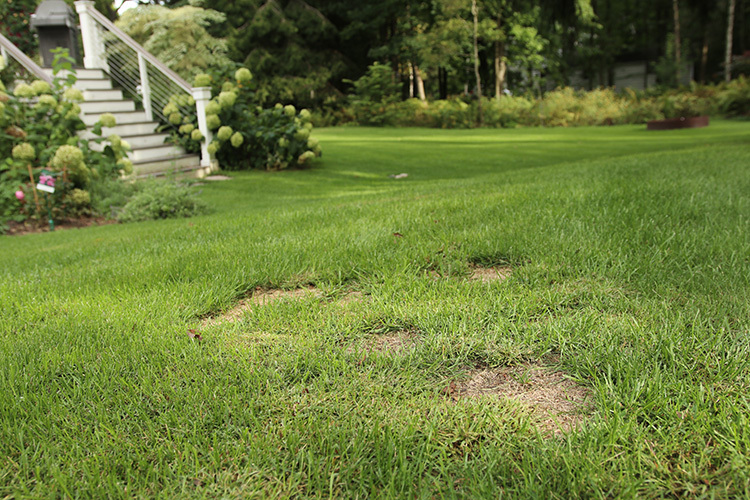 Healthy grass won’t allow weeds to get a big foothold in a lawn. 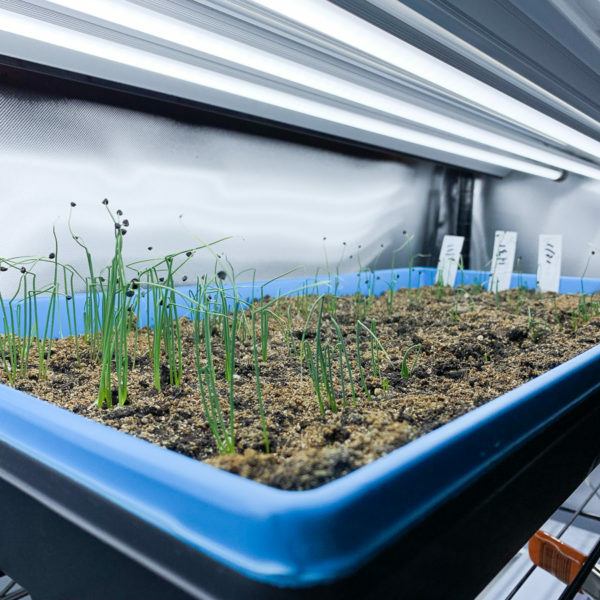 We use Milorganite, a high–nitrogen organic fertilizer that won’t harm flower beds (so you don’t have to worry about it landing in your garden) once in spring and once in fall. A broadcast spreader does a fine job of it. We try to time our fertilizer application to just before a rain, which helps it settle in and do its thing. The next job is to do some patching, and with two big dogs there is always lawn patching to be done. (We separate these two steps by several days at least.) 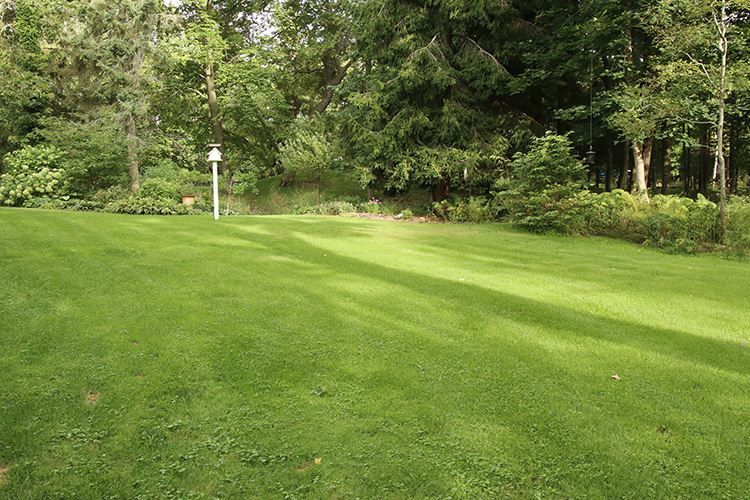 By the end of summer, our lawn looks like the surface of the moon in some spots. The fix is not difficult. First, I rake up the dead grass, which I add to the compost pile. 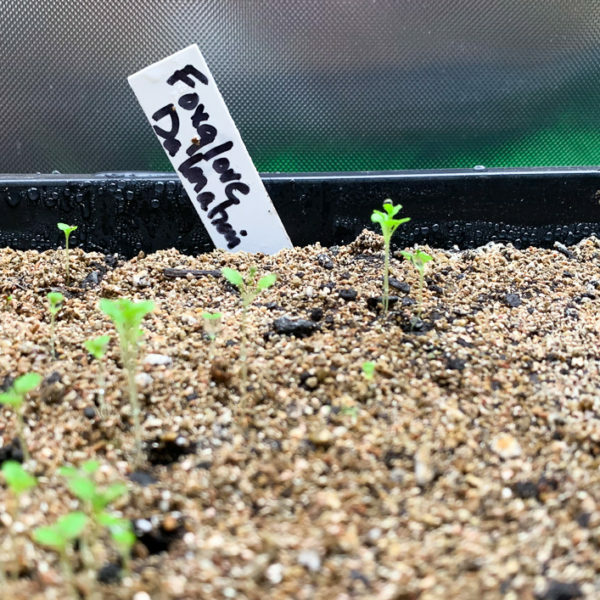 Then I sprinkle in just a bit of homemade compost (if you don’t have compost, a little bit of top soil would work too), then sprinkle on some grass seed, making sure the seed has good soil contact. If you want to use a little bit of straw mulch on top that can be helpful too, although not necessary. With two big dogs, our lawn usually has big patches that need repairing. Start by raking up the dead grass. 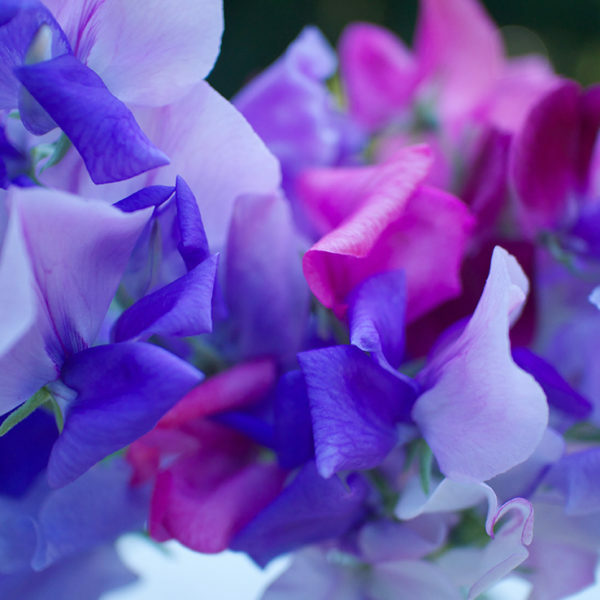 Add a thin layer of compost, sprinkle on some seed and make sure there is good contact with the soil. You can also choose to use a lawn patch kit that has mulch included (this is a non-organic option). 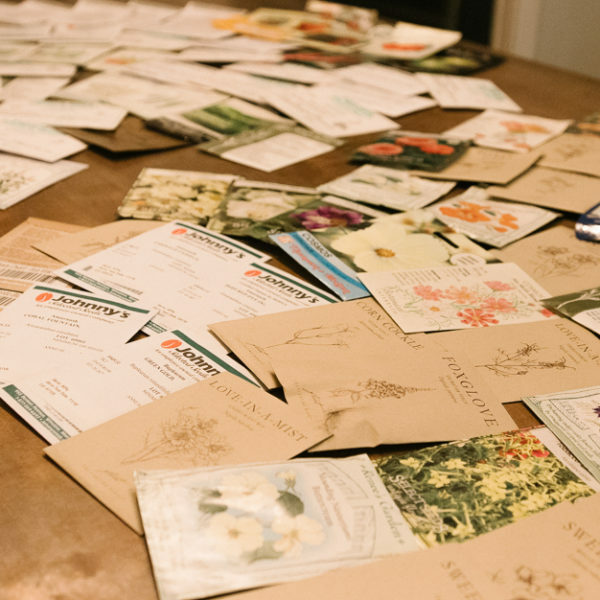 Either way, make sure to keep the patches well watered and try to keep people and dogs off of them while the seeds are germinating. This is the hardest part! And that’s all we do. I told you it was very low maintenance. There are a few “extra credit” items you can do if you’re for putting a little more time into your lawn. If you have compacted soil, a bit of aeration can help. You can rent core aerators, but I just take a garden fork and stick it in and rock it a bit in the compacted areas. If you follow this up with thin top dressing of compost your lawn will love you. We also overseed on occasion, just to help fill in slightly bare spots. 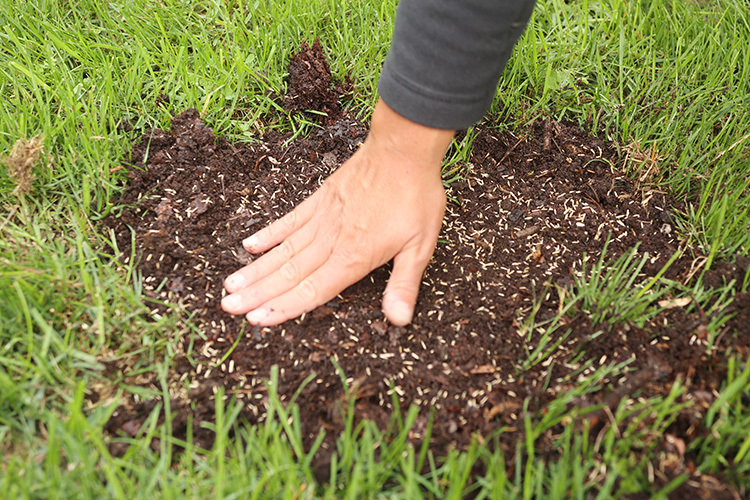 Do this by simply spreading seed (I usually use a handheld broadcast spreader for this), and then making sure the lawn is watered so the seed germinates. That’s all there is to it. I end up with a green lawn that offers a rest for your eye in between gardens without a huge time commitment. 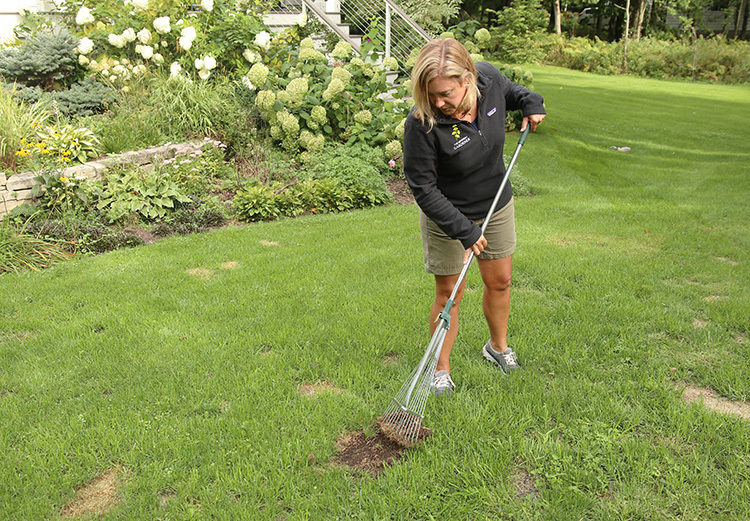 Do you have a fall lawn maintenance routine? It’s not perfect, but our lawn is green and organic, just the way I like it. Thank you for sharing ! I’m having a problem with creeping Charlie weed. It’s nasty😖. I try to be organic and I don’t use awful chemicals. My question to you, what do you think about aeration? Have you ever used this method? Love to know your response. As for me, I’d almost always have to deal with moss during fall. It’s not a difficult thing to do though. I just make sure to scarify it but sometimes I’d also have to use a moss-killer product before scarifying (I do try to avoid this though whenever possible). This is a nice post. Thanks for sharing!